Trader Joe’s: What’s in your shopping bag? Well, that was then and this is now, when California-based Trader Joe’s stores are an ingrained part of our shopping culture, and TJ’s — with their secretive house-brand products — can be found all around town (the latest is slated to open in Redmond October 9). I hit my local TJ’s regularly, stocking up on things I can’t live without. Just about everyone else I know apparently does so, too. “Homemade?” Uh, not exactly, but I won’t tell if you don’t tell. Remember when I told you about my well-fed book club — whose members love to cook almost as much as they love to read? Well, at last month’s meeting, as we were sitting around the dinner table yakking about our latest book, I asked which Trader Joe’s products they couldn’t live without. Did I ever get an earful (and some great ideas). Mary Kay turned me on to frozen organic brown rice (“ready in 3 minutes, always fresh, it makes healthy eating on the run easy”). Chris always has “canned tomatoes in various forms, for those nights when I’ve been busy or just reading all afternoon.” With canned tomatoes in the pantry, she says, she can quickly whip up some pasta. 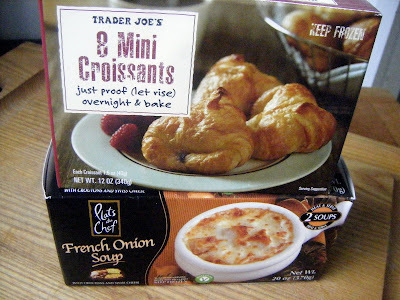 Carol loves the frozen chocolate croissants (“something I always make for houseguests”) and Jan keeps those on hand too, as well as the frozen french onion soup — at my suggestion. Sandy says, “Dried fruit? 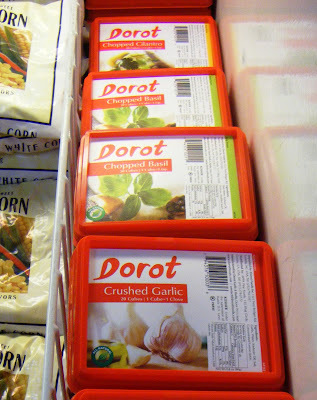 I never buy it elsewhere!” She also says “I can’t do without the cubes of frozen garlic. Each cube is one clove, minced and very fragrant — there are 20 to a package.” Found alongside the garlic in the freezer case are chopped fresh herbs. Mina swears by the frozen basil and given their thumbs up for those products, I caved and bought the cilantro cubes last week. Go ahead and scoff, but my garden cilantro’s long since bolted and I tend to throw away more store-bought cilantro (regularly found rotting in a rolled-up paper towel in my produce bin) than any other herb. Yes, they’re frozen. So sue us. Maria insists “their tsatziki and hummos are the best you can find anywhere,” while the other Nancy (a former caterer) loves the corn tortilla flat bread crackers, the salty chocolate-covered almonds and the organic Trek Mix with nuts. And you know how TJ’s posts those signs that say, essentially, “Try it, you’ll like it” — noting that if you don’t, bring the product back and they’ll give you a refund? I did that once with some reputedly fabulous canned coffee. Hated it! They didn’t blink an eye when I came back with the can and told them so. Nice.